The Model T looks to be a 1917-1920 model year, picture taken in 1924. Model T on the Rails, somewhere on the San Joaquin & Eastern rail line between Auberry and Big Creek, California. Image taken in 1924 and scanned from the original negative from the Fresno County Library Collection. This is an excellent view of the rail line that appears as a line along the slope of the mountains in the background. The SJ&E was primarily used to haul construction equipment and supplies for the building of the Huntington, Shaver and Florence Lake dams. However, freight and passengers were also carried along the line. The Slow Jerky & Expensive RR. I used to work at the Big Creek Hydro project. Been on that rail road grade many times. 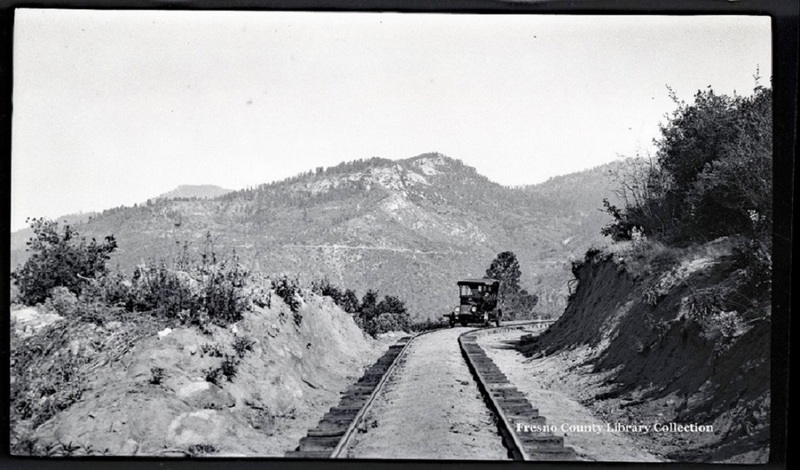 It was also known as the Rail Road that lighted Southern California. Amazing engineering. My Grandparents honeymooned by railroad flatcar on the Hetch Hetchy Railroad. Grandpa Butler had a job building the dam. Grandma said the winter was rather cold in a board floor canvas tent.